Midwest Motors in Eureka MO is your home for CM Truck Bed sales and installation! We have a wide selection of aftermarket truck beds, flat beds, service body, utility body, and replacement truck beds for sale at our location near St. Louis. Our crew has years of experience installing flatbeds and flat bed accessories. Looking for a service body or a utility body? Our service body and utility body installs are top notch – we use high quality parts because we know your truck needs to be able to stand up to the work load. CM Truck Beds have brighter lights and use less power than standard incandescent lights – keeping your vehicle safe and well lit on the road. Using only the strongest, most durable materials, CM Truck Beds have headache racks that work hard to keep you safe. Ours is the best in its class, with an independently tested gooseneck hitch built with longevity and durability in mind. Also included is a 7 way electrical plug that gives you plenty of options for power. 4" channel frame rails give your bed a longer life by preventing interior rust and adding durability. The SK Truck Bed comes with 3/8" side rails and stake pockets. They are DOT approved so you can secure your load with confidence. 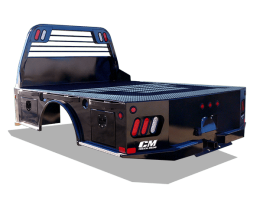 Made with heavy duty materials for a heavy duty lifestyle, CM Truck Beds can withstand and keep up with even the most strenuous jobs – other makers use 11 and 13 gauge floors that can bend and crack under heavy loads. Ours will last you. Designed to last through even the toughest jobs, our modular sealed wiring harnesses reduces deterioration and helps put a stop to corrosion and wear. The 7-Way round and 5-Way flat electrical plug system allows you to hook on to any trailer with across-the-board adaptability. With an independently rated bumper pull hitch, you'll have best in class towing capacity. Structural 4" channel frame rails are stronger, more durable, and prevent any rusting from the interior of the tube. Recessed tool box doors provide security and protection from the elements for all of your tools and extra gear. Dual locking latches keep your tools secure and safe – and you can even lock up with a key and padlock loop if you want! An angled fuel fill ensures that while fueling your work truck, you wont end up splashing fuel back on yourself.